For so many of us, when we’re thirsty we walk into the kitchen turn on the tap, fill our glass with water and quickly quench our thirst. We don’t often think of where that water comes from, how it got to our house or what it took to make it potable. I think most would agree that in this part of the province, perhaps even the country, we take our safe drinking water for granted. We’re fortunate to have this precious resource and we should be grateful that there are many people behind the scenes that help to keep our drinking water safe. Scott Beaton, Habitat Conservation Specialist with Manitoba Habitat Heritage Corporation (MHHC), said that through his work with MHHC when it comes to protecting Manitoba’s water supply every acre counts. “Our mandate is to maintain habitat for wildlife, but while we take on projects to meet these goals we accomplish a lot more, especially when it comes to wetland restoration projects,” said Bea-ton. The wetland restoration program is designed to redevelop water basins that have been previously drained. Water basins take on a variety of names and are often referred to as sloughs, potholes, swamps, ponds, bogs, marshes or wetlands. 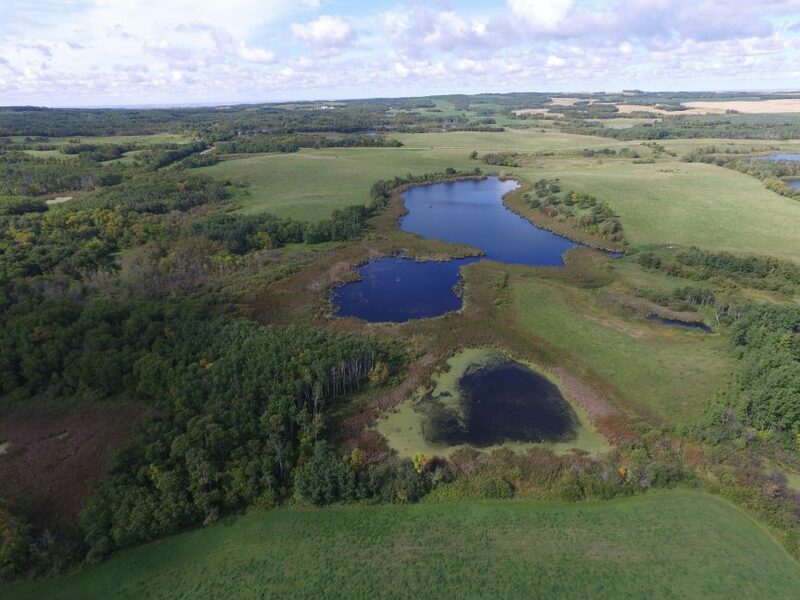 A recent project in the Treherne area, thanks to a generous land donation of the late Mr. Neil McEachran, has allowed Manitoba Habitat Heritage Corporation to restore 15 acres of wetland on the quarter section of land he donated in 2015. While this may not seem like a significant res-toration project, every acre of wetland in this area has a positive effect on wildlife as well as on downstream water quality. “This project created two small wetlands that are relatively rare in this landscape. The wetlands provide a stopping ground for ducks and other waterfowl to use before larger bodies of water open up in the spring. As well, elk, deer and a whole host of other wildlife in the area will take ad-vantage of the resource now that it’s available to them,” said Beaton. Wetlands are one of the most productive natural ecosystems that exist. Retention of water helps with flood control, prevents erosion, purifies water, and provides habitat for a variety of native plants and animals. In addition, as with all wetland restoration projects, one of the main objectives is to slow water flows, allowing time for phosphorus and sediment in water to settle, reducing concentrations in the water. This helps to improve water quality and reduce algae blooms downstream. Surface water from the McEachran property flows into the Boyne River ultimately making its way to Stephenfield Lake. The restored wetlands will help to filter the water and delay the flow, which will now filter down through the soil into the Beach Aquifer prior to making its way to the lake. Water from the lake is treated by the Pembina Valley Water Cooperative and is piped to St. Claude and Haywood as well as to the rural municipalities of Dufferin, Grey and Thompson. The municipalities of Roland and Morris as well as the Town of Carman are also partially supported by this system. “These are the type of projects that make me appreciate my job and the work that MHHC does. A lot of people think that we’re only interested in restoring large marshes but in reality, the small-er projects are very effective and often easier to accomplish because we’re working on only one piece of property and often with one property owner,” said Beaton.